not planned but emerging of its own accord, in its own timing. 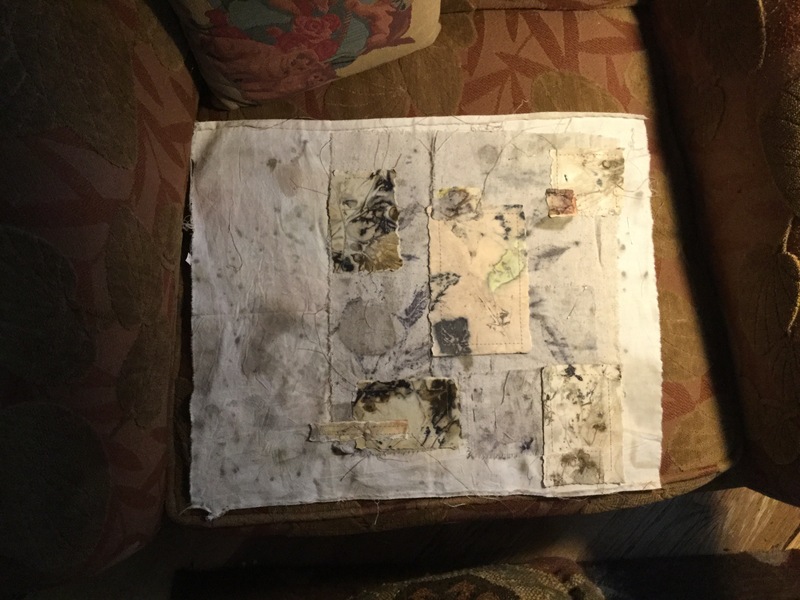 After a very difficult summer of worry and sadness re family health, I emerged with some pieces of cloth dyed with Grand kids, etc and tried to put together a cloth collage of this time. Fits and starts, nothing seemed to come together until one day, I realized that this is not what I do. My cloths come from a sense of nature, of the land, of my presence alongside my physical landscapes’, the land speaking to me in quiet and strong ways – this is what I do with cloth. Here I was forcing a reconciliation of some kind, naming the cloth Transitions but I couldn’t work on it. 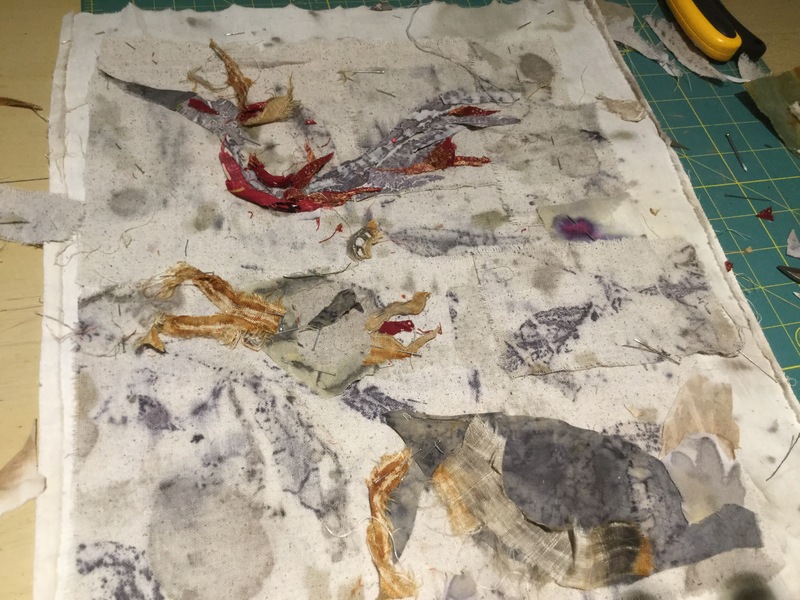 Every time, I pinned a piece or tied to take a stitch, it didn’t feel right…paying attention to that sense of forcing the subject, I put it away in a drawer. Many pieces of this cloth were dark colored, walnut, iron dyes, etc. After the Women’s March, the need to take out this cloth and simply hold it in my hands for a while was very strong. As I did, the sense of bringing light back into my days, into this cloth simply took over…garishly dyed onion skin cloths allowed the levity and knowing that was needed to continue with this cloth. As I re-pieced, re-pinned, re-stitched, the name of the cloth became clear- Come Together and I slowly did, re-balancing myself and my days.. Sometimes it takes that stepping back and listening ; sometimes it takes strength to discard what you are working on and cast assumptions and presumptions aside, allowing the heart to mend, allowing the mind to settle, allowing what truly needs to come forth, simply Arrive..
Hi Marti–what a pleasure to hear from you. I do hope that all is well and/or resolved with the family health issue. And as you know, i do understand how unsettling that can be. It’s like one’s center of gravity or balance gets flip flopped. Come together. Coming Together. Arriving. I will hold these words and the imagery they invoke and gain some sense of courage and steadfastness from them. There is something I’m wanting to say about that–about steadfastness and courage–about community and supporting each other. But whatever it is, the sense of it all have not evolved into words. I would love to hear, truly, how things are in your precious planet place. And sending forth much love your way. Thanks for asking Patricia, things are quiet and back on an even keel . My daughter Erika has recovered from a swimming accident that gave her a serious concussion that took many months to heal. Since January, she is back to teaching in a private college. She is an ESL professor..
We suffered two deaths in our family, my son-in law Adrian’s father Harold and my daughter Shelley’s boyfriend’s father, Matthew in October. Harold lived in England and Matthew in New York. Adrian’s Dad Harold was my dearly beloved pen-pal. Harold and I were the chatter boxes in our respective families, communicating every month via emails, snail mail, and the occasional phone call for over 13 years. Many a time through our writings and chats, we figured we solved the problems of the world even though we disagreed just as many times! Jill, Adrian’s mum and Harold’s wife and my husband Rich were the quiet ones but Harold and I made up for it… Jill died several years ago and Harold died this August at the age of 91. I still miss the old dear and always will. He had a wit and sensibility about him as well as a kindness, that is all too rare..
Life goes on and as always, the bright lights in our lives are our grandchildren who continue to thrive. They will be eight in May and in June, we travel to Colorado for a family vacation with them and their parents, visiting Rocky Mountain National Park for a few days and then they will come here to New Mexico for a few days. It certainly has been a time of departing for your family and i thank you for sharing all of this with me. so much love in your tribe. so many strong individuals who hold together its fabric. and indeed, the grandchildren. i’ll be thinking of you and their visit with you. sounds wonderful. thank ya Mo. you’re heading into fall i think. until i got the eco printing bug i didn’t realize so much eucalyptus grows there. i have a “neglecta” in the ground but it looks dead! love your descriptions. much I recognize about how cloth reflects life. in my experience, sts a piece comes together with a kind of effortless knowing and sometimes it doesn’t. I try not to attach a story to that, in part because the results don’t necessarily reflect how the thing came together. But apropos of the time limit: I once challenged myself to piece a tiny blanket with only the scraps on my floor or table and in a single afternoon. This was after reading that the Gee’s Bend quilters did their cloth work after working 12 hours in the fields. Granted, it was a simple geometric blanket, but it was an interesting exercise (and I loved what came of it). good to hear from you Dee. off to check out Gee’s Bend quilters! yes, the journey, it’s a thread.